This photograph shows the Dean Building, which housed the Center for Applied Behavioral Sciences at the Menninger Foundation in Topeka, Kansas. Previously the building was a retirement home for Security Benefit Association (SBA) members. Also on site were a hospital, an orphanage, and a model farm. Members paid a nickel per month for a place in each of these facilities for themselves or their children as circumstances dictated. 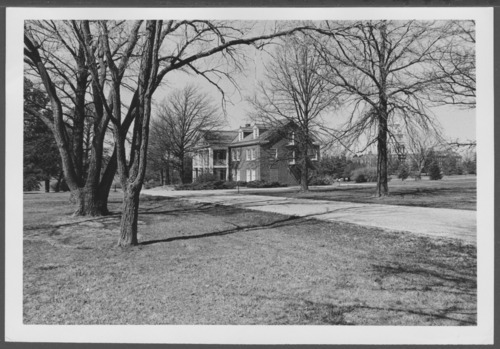 In the 1950s, the Menninger Foundation purchased the grounds, which it developed in 1982 into a residential-scale community of 28 structures called the 'West Campus.' In 2003, the Menninger Foundation moved to Houston, Texas.